This is easily one of the cutest stamp sets ever! I love bunnies and this sleeping one is so sweet! I used Copic markers to colour the image but I’m so sorry, my baby erased the file on my iPhone with the colour numbers. Here is my best guess: pot E31,33,35, bunny nose, R10, body W-1,3,5,7, shadow E53?, leaves G21,24,28, flowers BV?, Y35, wash around image Y21. Be sure to visit tomorrow and the next day to see more fabulous sets being revealed by Clear Dollar Stamps for June! I just love release days!!! Be sure to visit Clearly iStamp to see the other team members who are revealing this stamp set on their blog and to see the full set! Hope you love it! I know I do!!! Previous postGlittery Lateness for Whimsical Wednesdays! Oh my this subtle and sweet bunny is just the most precious thing! Gorgeous card design! I was thinking the same as Stacy, I love the softness of this card. Very nice! Hi Rebecca, what an adorable grey bunny! She is just so precious! Beautiful coloring on this card! Keep it up girl!! 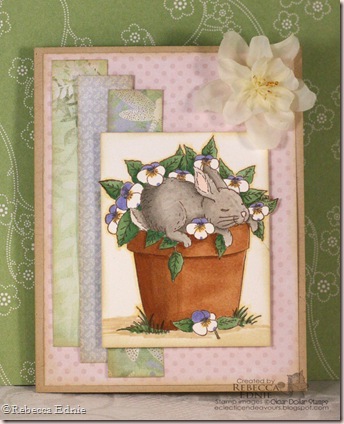 Love the sweetness and softness of this card… lovely.